Sunset Reports is a software tool that can do perform quite a variety of tasks, from being the foundation for an Information Management System to simply designing and running reports. It was originally developed back in 1997 and the functionality and architecture has evolved over the years on different platforms and during that time the software was part of several different applications and software products. The fundamental concepts are mature, and the technology is current. With its flexible data connectivity, it can easily connect to such databases as MS Access, SQL Server, MS Excel, Oracle, OLEDB, ODBC, MS Outlook, MySQL, and more. Its visual query builder includes such features as grouping, sorting, filtering, sub-queries, derived tables, union queries, advanced properties, aliases, virtual fields, various SQL dialects and visual representation modes. The report designer handles all types of content, controls, bands, 56 different business graphs including regression and trend plots, over 100 different gauges, plus parameters, scripts, pivot tables with OLAP and KPI graphics, wizards, labels, barcodes, mail merge, drilldown, drillthrough, document maps, and multiple reports within a single report. 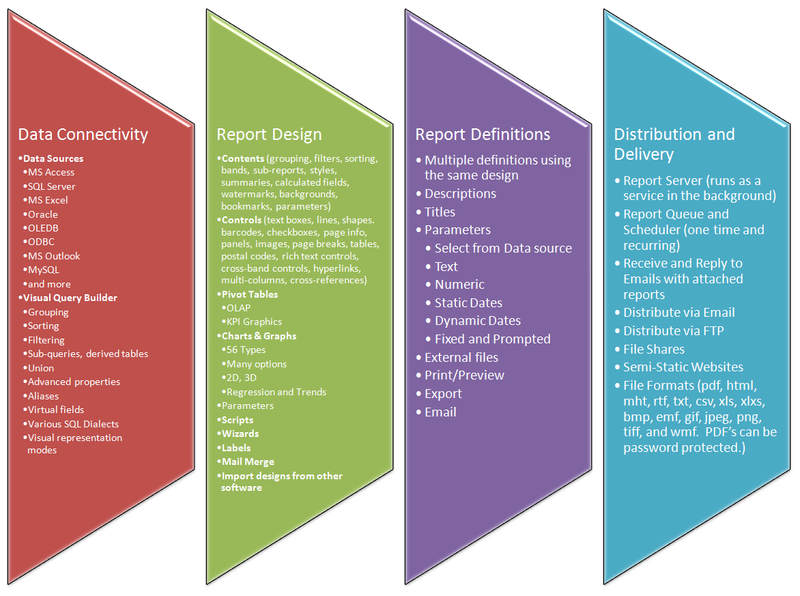 And you can even import report designs from Crystal Reports, Microsoft Access, Microsoft Excel, Data Dynamics Active Reports, and DevExpress. Even RTF files from word processors like Microsoft Word can be imported into a report design. Worksheets from Excel can be imported to become reports too. You can create Master-Detail reports, subreports, cross-tab reports, parameterized reports, multi-dimensional reports, interactive reports, drill-down reports, and more. Reports can be exported as documents: pdf, html, mht, rtf, txt; Data: txt, csv, xls, xlxs; Graphic: bmp, emf, gif, jpeg, png, tiff, wmf; and PDF’s can be password protected. Reports can be previewed, printed, sent via email or transferred via FTP. The Report Server runs as a service in the background and handles report subscriptions and the report queue. It even monitors email requests and replies to emails with attached reports/documents. The report queue allows for scheduling of reports including recurring schedules and provides easy to use list and calendar views. And it is more than just a reporting tool. With the features of window mode, startup parameters, scripting, and interactive reports, the program can be the foundation for further customization so you have control over the user interface. Learn how to program in VB.net, C#, or J#. Besides using Sunset Reports as a reporting tool, it is perfect for information management, data analysis, business analytics, visualizations, web site design, making labels, data conversion, document management, document distribution, and more. And it is affordable for the small business! Versions are available for workstations, servers, and the entire enterprise.